Shun and Karen Wakefield lead the First Impressions Team. They were both born and raised on the east coast but recently retired from the military, the Wakefield's have decided to make the Pacific Northwest their home. 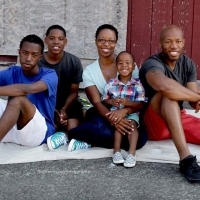 Shun and Karen were married in August 2007 and have three children: Xavier, Cevion, and A'sher. Shun enjoys playing all sports, working out, and being a movie buff. Karen enjoys Crossfit and spending time with the family.